1. Heat 1 tbsp oil in a large frying pan and fry the pepper, salad onions and celery for 4 minutes. Add the pibil paste and cook for a further minute, then season. 2. Meanwhile, spread the tortillas with the refried beans. Divide the cooked vegetable mixture evenly over 4 of these and sprinkle with Cheddar. Top with the remaining 4 tortillas. 3. 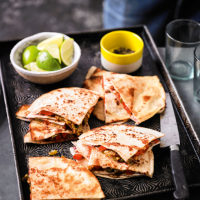 Heat a little oil in a frying pan and gently fry the quesadillas for 1 minute on each side or until golden. Cut each into 6 wedges and serve with lime wedges on the side to squeeze over.